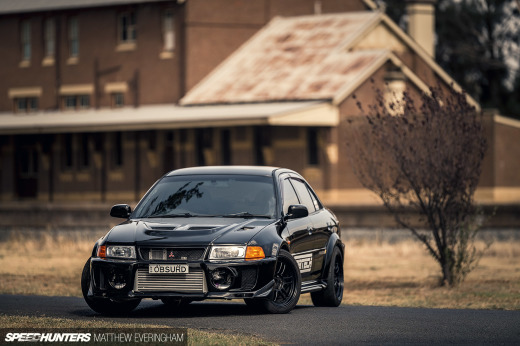 We’re all aware of the Lancer Evolution’s heritage and prestige amongst fellow car enthusiasts; a reputation earned by Mitsubishi’s success on the World Rally Championship stage. But with the Japanese automaker’s WRC successes long in the past, what does the Evo stand for now? 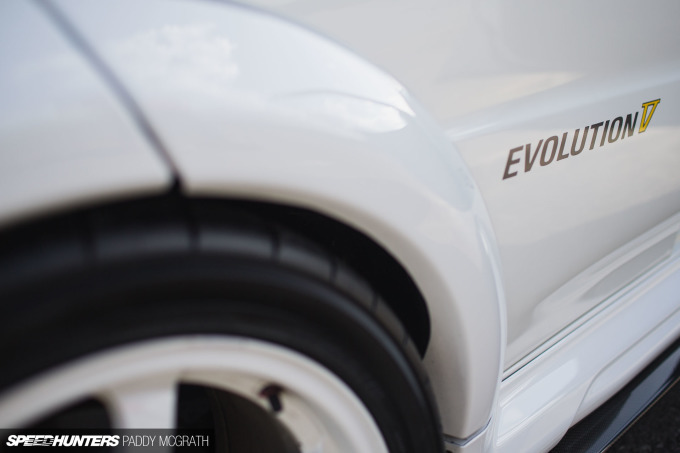 Most contemporary Evo builds seem to be about power figures, which to be honest is something I’m completely fine with. These are cars capable of transferring power to the ground in an efficient and often exciting manner, and that’s good. Sometimes though, I appreciate when someone revisits what the Lancer Evo has always been for me: a car with devastating cornering ability. 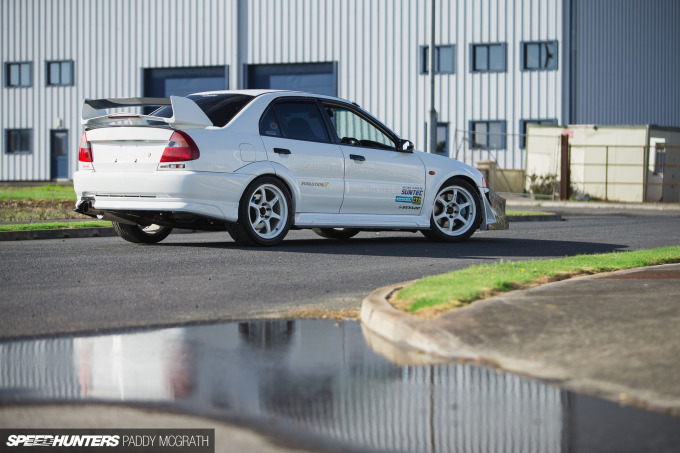 This particular Evo has a bit of a storied past too, which only adds interest to an already exciting platform. 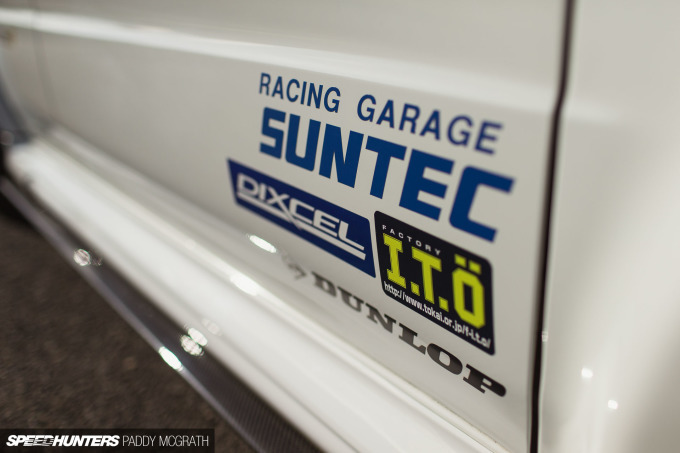 Originally developed as a gymkhana car by Racing Garage Suntec in Tokyo, it was exported to Ireland last year where it has continued to evolve with a similar ethos under its new owner. Power is modest with around 350 horsepower available, but the delivery is smooth and lag free. It’s a lightly tuned Evolution VII 4G63 engine with some bolt-ons, extra cooling and hard piping, but nothing too drastic. By keeping things relatively civil, you’re rewarded with response. 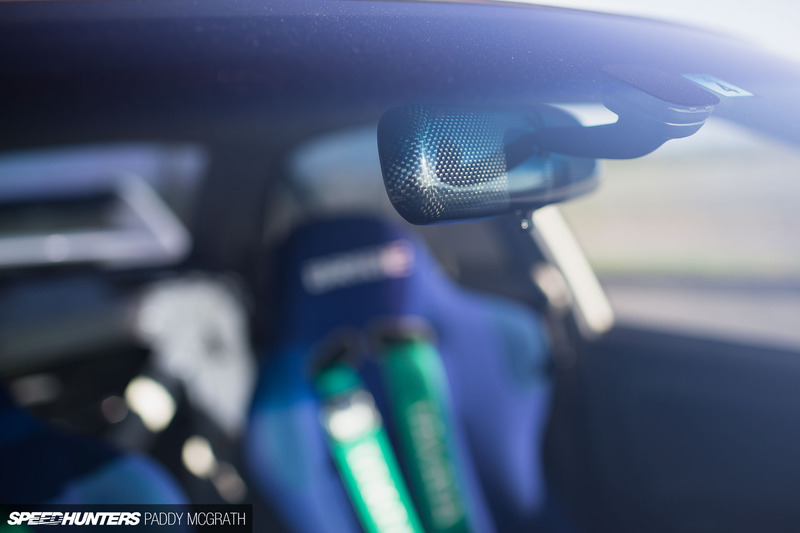 It’s certainly closer to a street car than a track-only race car, which only enhances its appeal. 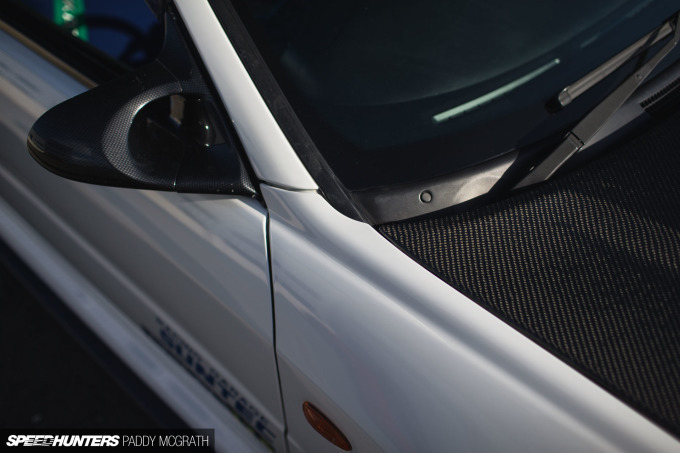 One of many upgrades it received once it arrived in Ireland was a pair of carbon-Kevlar Bride Zeta IIIs, perfectly suited to this car’s low weight scheme. 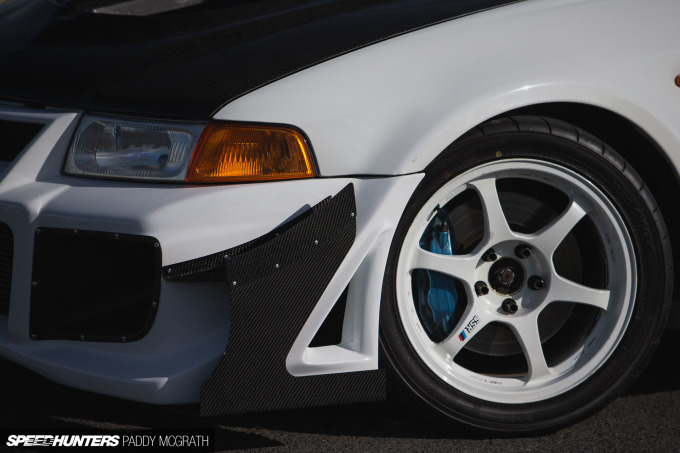 There’s an impressive plethora of bracing spread throughout the Evo too, from front to rear and pretty much everywhere in between. 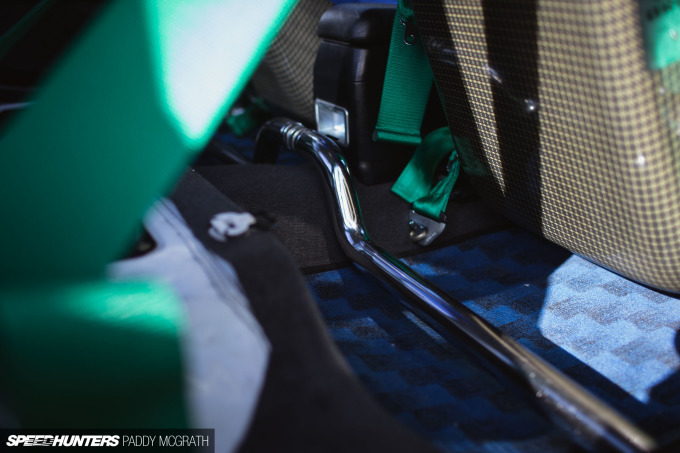 Like this Do-Luck floor brace behind the front seats. 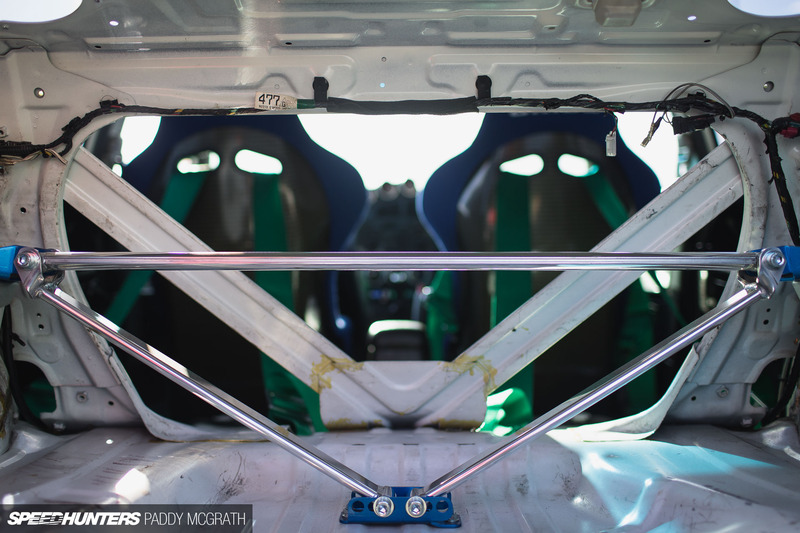 The bracing increases chassis rigidity without the weight and permanent nature of a full roll-cage. In addition to the factory RS bracing, Cusco, Mine’s and Jspeed components have also been employed to pick up the slack. Probably the most impressive pieces of the car and certainly those that have the largest impact on how it drives are the parts that you can’t really see. I’m talking about the driveline. The engine has been mated to an Evolution VIII close-ratio gearbox with a long final drive and a Cusco twin-plate clutch. 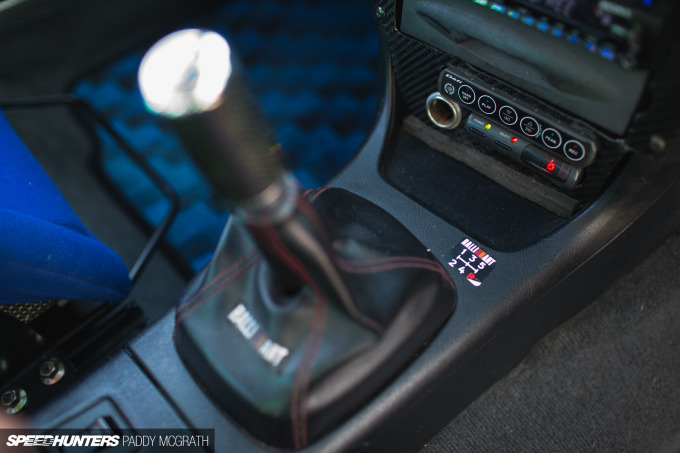 There’s little slack in the clutch pedal, but it engages smoothly and gives solid feedback through the left-most pedal. Cusco plays the largest part here again, with its RS front differential and MZ rear 2-way LSD. In unison with the Öhlins suspension and 255/40R17 Yokohama Advan AD08 tyres, the setup provided far more grip than I ever needed during a quick drive. 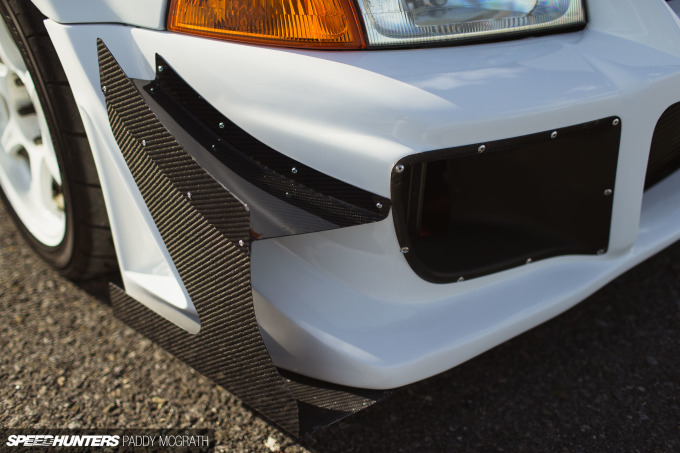 The Evo’s outward appearance has been rejuvenated with assorted Varis pieces including the bumper, carbon bonnet, carbon canards and carbon air guides. 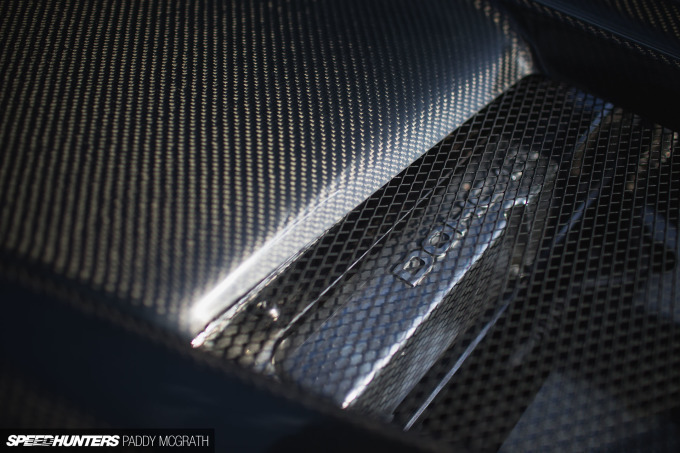 The contrast of the carbon fibre touches is well balanced against the immaculate white paint. 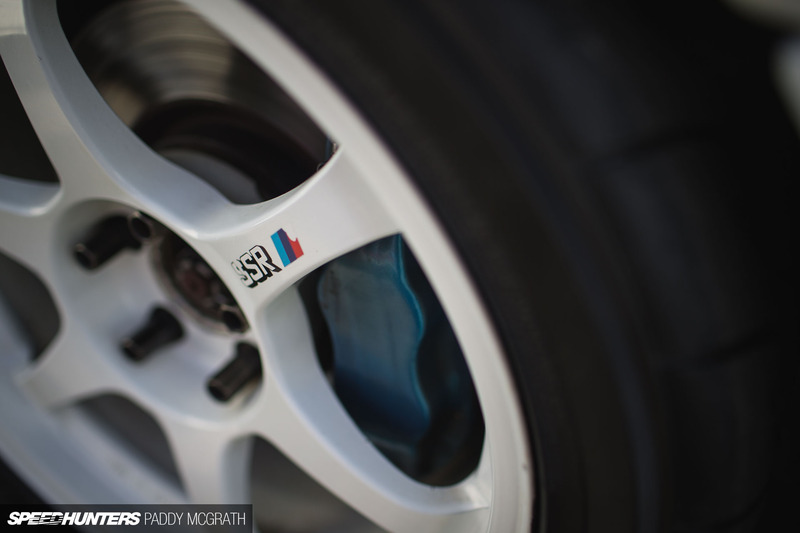 In the wheel department, SSR Type Cs measure in at 17×9-inches all around, with a slight variance in their offset from front (ET28) to rear (ET40). Evolution VIII GSR Brembo brakes have been paired with Carbon Lorraine RC6 pads, braided lines and Dixcel discs to provide plenty of reliable stops. They’re certainly enough brake for the car. 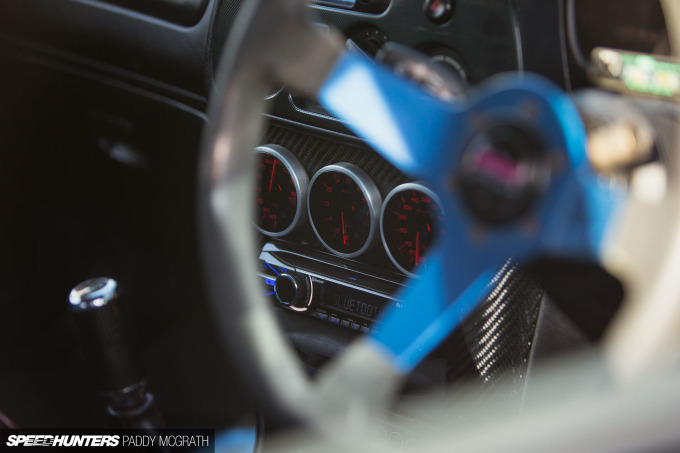 The Lancer’s current owner is still finding lots of clever little modifications spread throughout the car from its previous life in Japan. 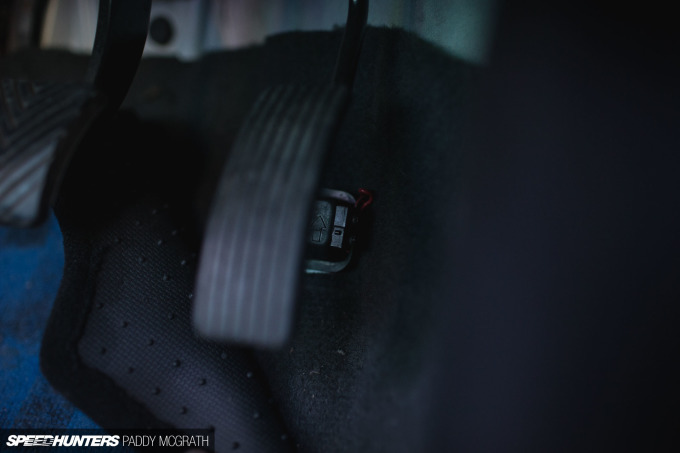 As an example, this switch behind the accelerator pedal activates the intercooler sprayer when the pedal is depressed at 100 per cent. There’s also some neat ducting underneath the car for cooling and extracting. Typically, when I’m offered the keys to take a car for a spin after a shoot, I politely decline. When it’s another person’s pride and joy, you always think worst case scenario and I don’t think I could live with myself if I damaged or money shifted the car. But this time the temptation proved too much. 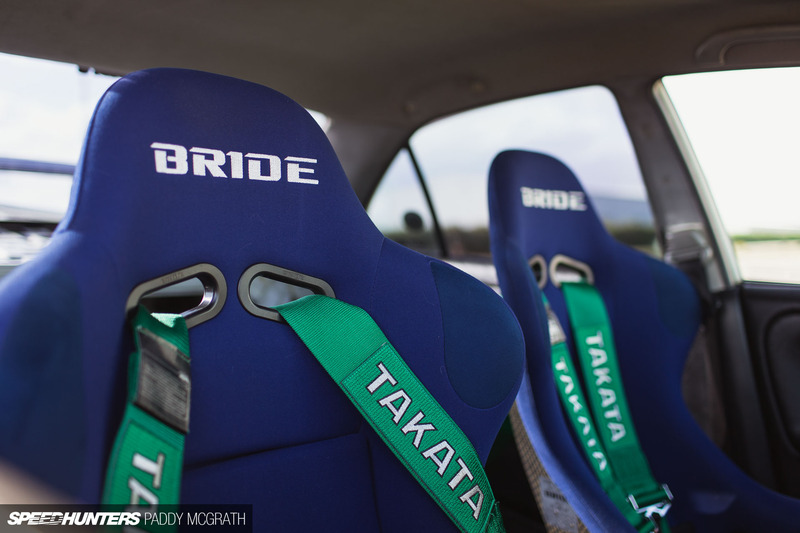 Falling into the Bride driver seat, Takata harnesses secure, the car pulled away easily with only some minor effect from the locking differentials when turning at slow speed. 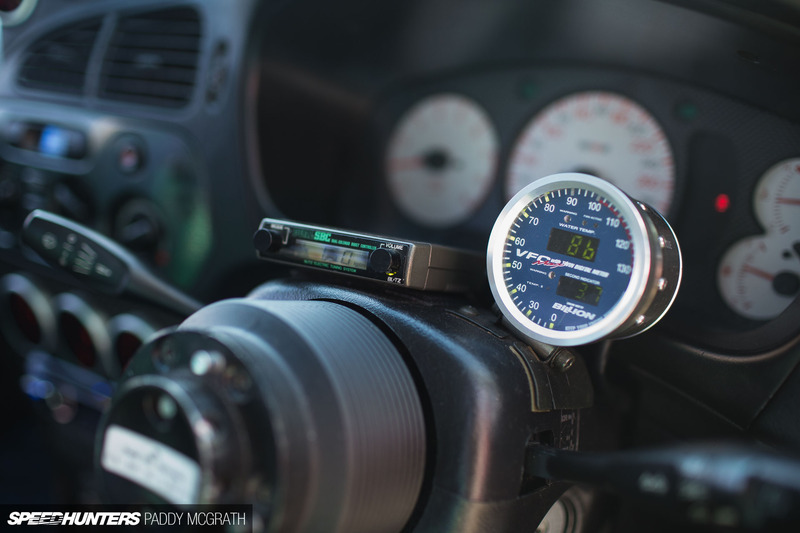 Gear shifts were clean and precise, even as speeds increased. Short-shifts gradually extended as confidence built, but pretty much from the off I realised that this is more car than I am driver. However, it’s not intimidating; it’s encouraging. You find yourself braking that little bit later, turning in that little bit more aggressively, and the car is positively unfazed. There’s a huge amount of information here for the driver, but luckily I had a passenger to watch them whilst I concentrated on the vitals. With each passing minute, I could feel my heart rate rising and the smile on my face growing. 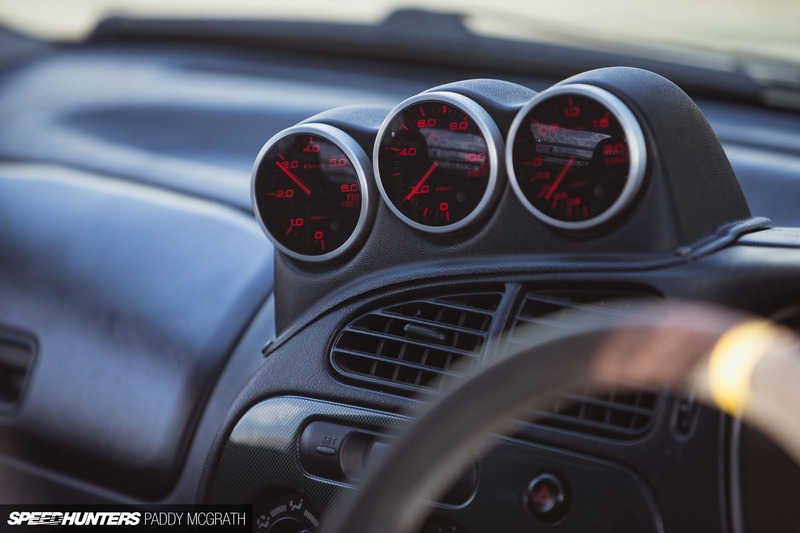 Accelerate, upshift, accelerate, brake, downshift, turn in, wind off lock and accelerate again. It’s such an addictive car to drive. It’s visceral from sound to feel and you’re constantly trying to find that little bit more, which – terrifyingly in some regards – is always there. It’s a driver’s car above all else. The relatively low horsepower numbers play a huge part in this because you’re constantly able to use all the power between corners. In fact, the tighter and more complex the route, the more this car excels. For me, it redefined a lot of things in what I think a car should do and be capable of, serving as a reminder that power isn’t everything. I feel exhausted even recalling my experiences with this car and am truly envious of its owner who can drive it whenever they want. 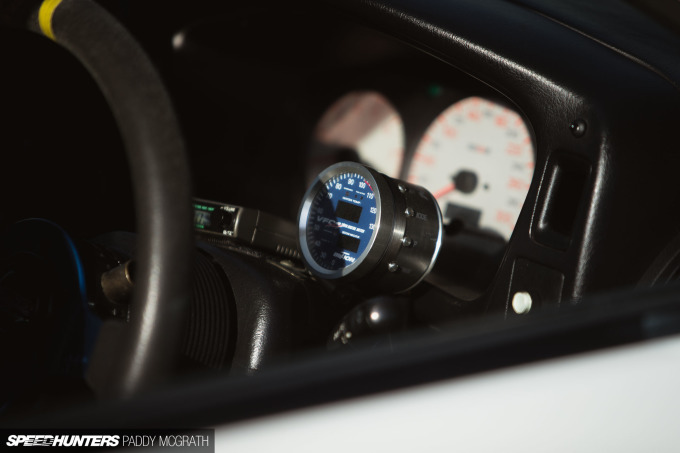 With that, I’ll leave you to browse the rest of the photographs below and watch a video or two that I found of the car during its life in Japan. Orgasmic car. 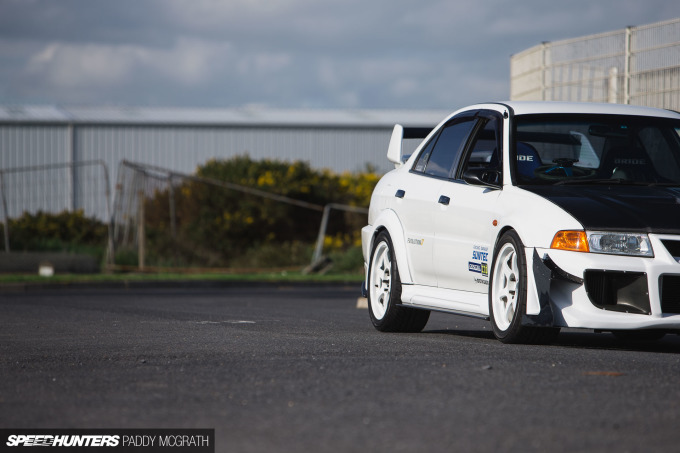 Despite myself not being a huge fan of Mitsubishi, this car definitely takes the crown of awesomeness. sweet, second video at 0:34 translation "my tyres!" Rocos It's the same car during its life in Japan, read the text. Great way to dangerously compress the spine in a rollover. Very nice car! How much does it weigh? gcvphoto Was thinking this exact same thing. I'm always amazed when I see builds on here that obviously a lot of money went into them but they miss basic safety stuff. In need of a harness bar at least. Sweet car otherwise. Definitively convince me that sooner or later I should replace my GTR R33 by an EVO V or VI though :p (even if less tuned than taht one). @Doug gcvphoto Seriously! How was that overlooked. Harness bars are not that expensive. Rocos Omg,why dont you read text first then comment? That sounds like a very good idea! Jocky Is there no way you can have both? A sorted car that includes video history. Perfect! I love it that the cars are tuned for drivability not power, normally cars that are setup this way are faster on the twists too. 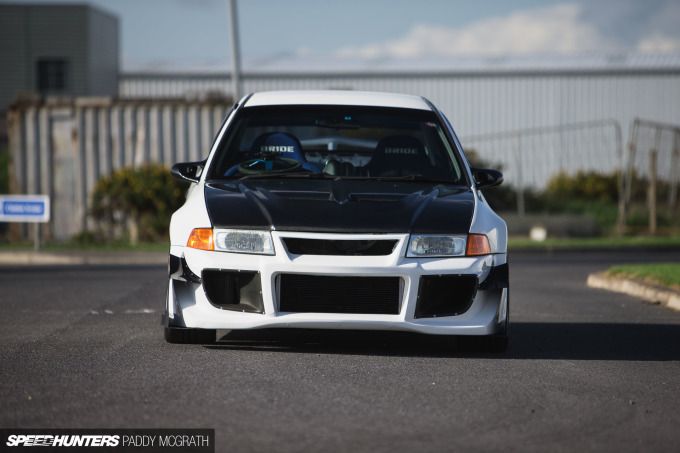 Brilliant build owner and great article Paddy! "When mounting shoulder belts to a roll cage or harness bar, the optimal angle of the belts (from the horizontal plane) is between 0° and 20° downwards from the top of the occupants’ shoulders or seat back opening. 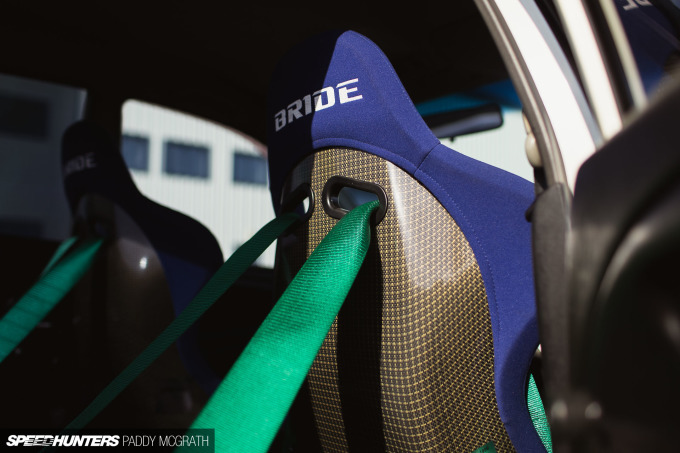 When a rollcage or harness bar is not available, installing a multi-point harness to the rear OEM seatbelt anchor points (D & E) an angle of 45° downwards from the top of the occupants’ shoulders or seat back opening is acceptable." RacingPast Jocky : I already had two other cars to play with (in different styles). Having another car will mean that one will stay in the garage (I already didn't drive the GTR a lot those last month... ). That's not fun, a car must be driven not parked as a piece of art (and I'm short of place to park it safely anyway). 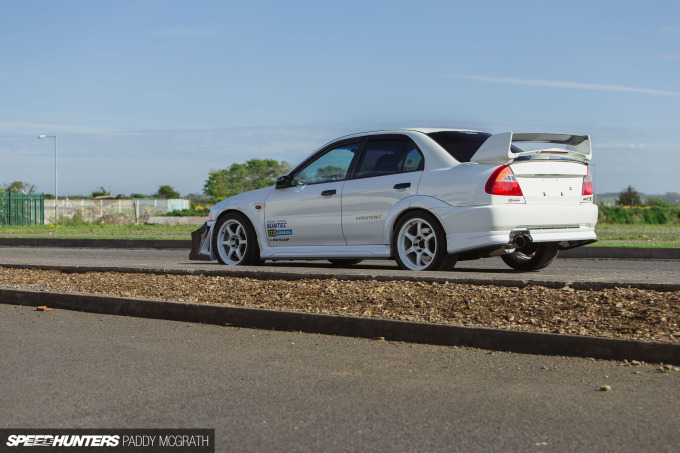 I'll not comment on the car as Paddy has already waxed lyrical about it in the article (quite rightly). But I love that footwork camera in the on-board video haha. 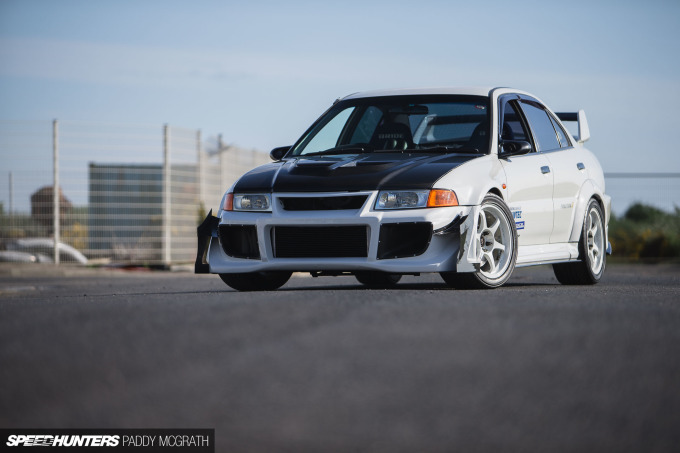 I just bought an evo with about 370hp at the wheels and it is serious. Definitely is no slouch, but this one is gutted so it would be very very quick. 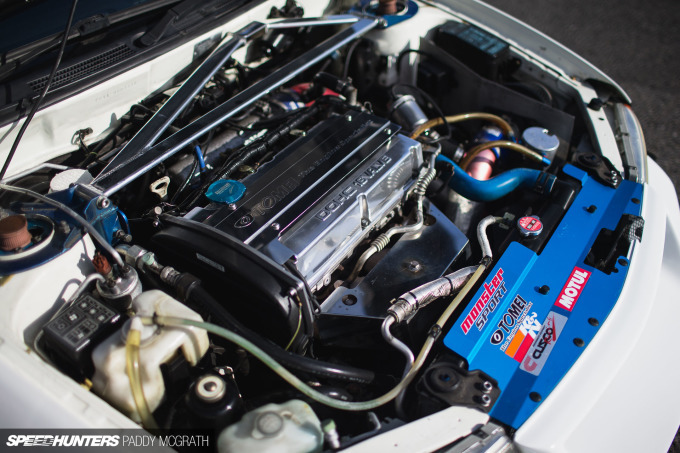 I LOVE the intercooler spray location. That is just creative brilliance! Absolutely awesome car, this is exactly what I have in mind for mine. Love builds like this, especially given the tendency for monster power 'street' and straight-line cars here in the States. 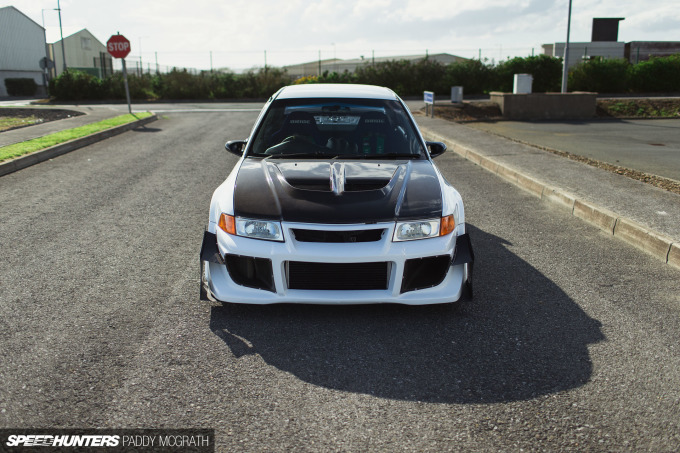 Being a boost junkie, of course I dig them, but they're far removed from the EVO's ancestral purpose. I must say, I am historically a Subaru guy, but the first time I drove even a stock suspension EVO with a mild turbo upgrade, it was like someone flipped a light switch. The handling and steering input was that good! @Adrian gcvphoto That's not right and it shouldn't be done. None of the OEM's mount like that and non of the other AM manufactures recommend that. @Adrian gcvphoto I don't know if I'd take my safety info from a representative of a company that has made millions of faulty airbags unless he/she was fully independent from that division....Then it would be OK.
jbfromsiliconvalley gcvphoto I see that thrown around a bit, but Takata's race and safety division is separate from their airbag business (AFAIR). I can't imagine that a company would open themselves up to liability by recommending one thing or another, especially in this litigious era, unless they were wholly confident in their belief. 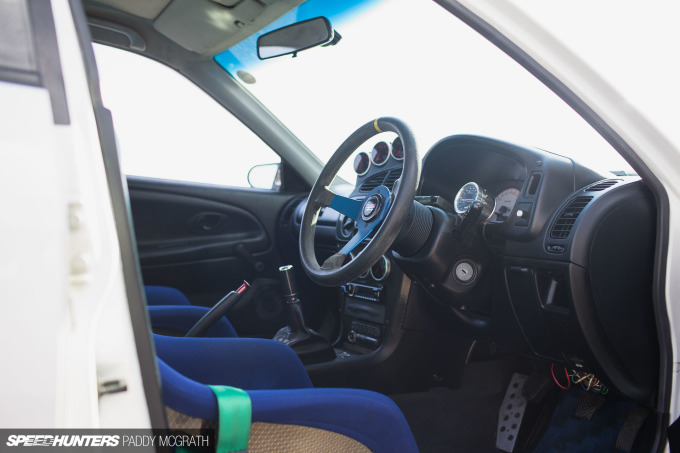 That being said, I would personally run a harness bar (along with a non-airbag steering wheel) if I was to run a harness in my own car. Gorgeous car and gorgeous shots of it! I was wondering if you guys at SH could add some info on the camera equipment you guys use. I know y'all did that "photography 101" series a while back which really helped me and most likely tons of other amateur photogs out there. I don't really mean every single pic because that would be way too tedious, but maybe a bio about you and your gear in some other section could be put up? I'm constantly wondering what lenses and systems you guys are using! xloki77x Paddy McGrath I've only just seen this now by chance, but like most of the guys here I shoot on Canon system with a variety of lenses.